Esta Soler helped pass the Violence Against Women Act, 20 years ago. Leslie Morgan Steiner had just left an abusive husband at the time, and now tells her story widely. They talk about the NFL, the hashtags #WhyIStayed and #WhyILeft, and what we can all do to end domestic violence. Esta Soler and Leslie Morgan Steiner know exactly how to stop a conversation in its tracks. All they have to do is say what they do. Both Soler and Steiner are activists working to end domestic violence. Soler was instrumental in passing the Violence Against Women Act (VAWA), which celebrates its 20th anniversary on September 13. 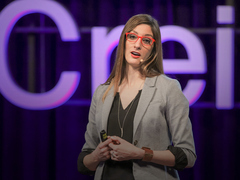 (Watch her TED Talk: How we turned the tide on domestic violence) Steiner, in her early 20s, married the man she thought was her soulmate. Then, he repeatedly held a loaded gun to her head. (Watch her TED Talk: Why domestic violence victims don’t leave). Teach people what to do if they are a victim or a perpetrator — or if they’re a bystander. Domestic violence is on many minds this week, following the release of a video showing football player Ray Rice knocking out his now-wife, Janay Palmer Rice, and the subsequent rise of the hashtags #WhyIStayed and #WhyILeft. On the eve of VAWA’s anniversary, we invited Soler and Steiner to talk about what’s gotten better in the past 20 years and what still needs to change. Below, an edited transcript. Esta, in your TED Talk, you call the Violence Against Women Act a life-changing act. How did VAWA change lives and what did it mean to each of you personally? Esta Soler: The Violence Against Women Act was the first major piece of U.S. legislation that put real money into changing the laws, into creating programs for judges and for prosecutors and into enhancing the network of community-based services organized by activists across the country. It was the first real public statement the U.S. government made that violence against women was wrong. So 20 years later, we have some good news to talk about: violence against adult women in the U.S. is down by over 60%. Does that mean violence against adult women isn’t happening anymore? No. But VAWA is one piece of public policy that the government can be proud of. Leslie Morgan Steiner: My abusive relationship ended in 1991, so before VAWA had been passed. At that time, how you were treated by the police and by your community and by judges was hit-or-miss. I was very fortunate that, on the final night of my marriage when my husband came very close to killing me, the police who came to intervene were great. They were very matter-of-fact and direct — which is what I needed. I was also very fortunate that I got good help in the criminal justice system. But it could have just as easily been that I wasn’t helped — that I was blamed. That’s what has changed because of VAWA. Millions of dollars have been pumped into educating police officers and judges and people working in the court system, so there’s a much greater awareness of the complexity of domestic violence. We still have a very long way to go, but there’s an awareness that it’s a crime. What we need to do now is to teach people what to do if they are a victim or a perpetrator, or if they’re a bystander. People are still contributing to violence against women because they don’t know how to stop it when they know it’s occurring. For me, even though the police were great, they never even brought up the possibility of my husband being arrested. That would have been good for me, and it would have been good for him because it would have been a signal to him that what he was doing was wrong. I was terrified when I had to go to family court — I come from a family of Harvard-educated lawyers, and I was still scared to go to the court system. I was convinced that the judge wouldn’t believe me, because I knew how charming and convincing my husband could be. I was very fortunate that the local domestic violence shelter sent a volunteer to represent me in court. I didn’t know that that kind of support was available, but she helped me — she ran interference, she talked to the judge, she talked to my ex-husband, she protected me. The fact that I was able to leave my abuser and rebuild my life is a testament to my great good fortune. What VAWA tries to do is make that not good fortune, but routine. The kind of intervention I got is now much more common, and it’s thanks to VAWA. Tackle the family court system. One big issue that we need to tackle — the family court system has not been much of a beneficiary of VAWA dollars. There are still a lot of family court judges who don’t know how much perpetrators manipulate the family court system, and children, to terrify the women who have left them. I think that’s where we really need to focus in the future, on making sure that judges are educated, and that they understand that this is not a regular family custody or divorce situation — that it is a category of the criminal justice system alone to itself. And I think to end the cycle of violence, we have to make sure that everybody who is dealing with the youngest abuse victims really understand what needs to happen to protect them. Make sure that any kid who’s been exposed to violence gets help early. Esta Soler: You’re raising a number of really big issues. I got my start in the DA’s office in San Francisco, and one of the first things we did was create a victim advocacy program to make sure that the cases that came into the court system were vertically prosecuted — that instead of the victim having to talk to the police officer, then the person at the arraignment and then another DA, that they had a victim advocate and the same attorney from beginning to end. That helps the outcome of the case, and helps make sure that the victim isn’t re-victimized within the justice system. Judicial education has really mattered too. At the end of the day, judges are leaders in their community for real systemic change. Create programs in schools and communities that give people healthy relationship tools. The next body of work that we need to do is the Defending Childhood Initiative. We have to make sure that any kid who’s been exposed to violence gets help early. We also haven’t done what we need to do around creating programs in schools and communities to give our kids the tools to have healthy relationships. And then we have the problem of college campus sexual assaults that is looming large and finally getting the attention it needs. When we go back to re-authorize VAWA the next time, let’s put more money into helping our kids. It’s not about just getting people help after they’ve been hurt. Let’s prevent this. It’s not about just getting people help after they’ve been hurt. Let’s prevent this. It’s interesting that the 20th anniversary is happening the same week that TMZ released a video of Ray Rice abusing his now-wife. What were your thoughts seeing this story and the huge reaction to it? Esta Soler: It’s like a bookend, because in 1994, as we were releasing our campaign for the original VAWA, OJ Simpson was arrested and we learned that he had a long history of domestic violence. The Ray Rice video release came on the day we were in Washington, D.C., celebrating the anniversary of the act. It’s a fitting moment to mark what we’ve been able to do since passing the act, and to take a sobering look at how there is so much more to do. Right now there is an incredible opportunity for the NFL to tackle this problem and become a leader. Right now there is an incredible opportunity for the NFL to tackle this problem and become a leader in this area. So many people look up to football players, and the policies that our sports leagues set send out the message to people that there is no excuse for domestic violence. What will their prevention program be for our young athletes in middle school, high school and college? What will the prevention program be for our young athletes in middle school, high school and college? The fact that the NFL made a strong statement that said “we will not tolerate domestic violence” — I think it’s a really important first step. We’re watching to see what else will happen. If the NFL trains its entire workforce and sets up programs in local communities to teach young athletes that this is not acceptable — we’re going to reach audiences that we haven’t been able to reach before. It could be a real sea change. Movements are made out of moments. This is the moment for the NFL to get it right. Movements are made out of moments. This is the moment for the NFL to get it right and put in place a major social norm program. Domestic violence is so very complicated. In order to end it, we really need to raise awareness of the complexity. That’s the silver lining here — that we’re getting an up-close and personal view of what it’s like. What were your thoughts seeing the hashtags #WhyIStayed and #WhyILeft circulating so widely? How is social media changing the dialogue about domestic violence? Esta Soler: And don’t forget #whymenabuseandhurt, which Kevin Powell added to this week. The important thing about the social media activity now is that real women are telling their stories — and they’re all different. Leslie’s situation is completely different from what Janay [Palmer Rice] went through or what the woman who created #WhyIStayed went through. The ability for individuals to tell their own stories and have them circulate — it’s wonderful, because others don’t feel as alone. Raise awareness of the complexity of domestic violence. In your talk, you’d mentioned how the Polaroid helped change public perception about domestic violence. How do you think social media is changing that further? Esta Soler: The Polaroid made the invisible visible — the picture shone a public spotlight on an invisible problem. Social media’s doing that now. If you look at the college sexual assault issue, it’s the young women activists on college campuses who broke that story on social media. Angie Epifano at Amherst, her blog went viral. The Columbia student carrying her mattress, she let people know what happened and is keeping that story alive. The good part about social media is that it’s easy to access and easy to spread. The bad part is cyber-bullying, and the fact that people can do really bad things anonymously. What do people still not understand about domestic violence? Leslie Morgan Steiner: People still ask, why doesn’t she just leave? There are about 100 reasons. One of them is that we know there’s a chance he’s going to try to kill us, or take it out on our children, or victimize us for the rest of our lives. It’s not as simple as just walking out the door. I actually didn’t know that I was a victim of domestic violence. Denial is so strong that this is pretty common. I would not have told you, at that time, that I was a battered wife. I thought that I was a smart, strong, independent woman in love with a troubled man, who I was trying to help. If you don’t know that you’re a battered wife, you can’t ask for help. I had no real understanding that it was a pattern — that in fact there were millions of victims just like me, and millions of perpetrators just like him. It took years before I could explain it to myself and understand that I was a victim of domestic violence. I’m not a policy expert or a politician or an academic, I’m just one person with a story to tell. The important thing about being a person with a story to tell is that you break the silence and try to raise awareness that this happens to women of all different ages, all different ethnicities, income levels, education levels — it happens in every religion, in every community. And to try to make people at every level of society aware of how complicated it is. Break the silence. You have no idea who you’re helping when you talk about it. You might be a lifeline to someone. When I was getting ready to publish Crazy Love, there were a lot of people in my life who wanted me to publish it anonymously. I felt like I couldn’t, in good conscience, do that, because I thought that maybe other victims would think that I was being anonymous because I was ashamed. I’m not ashamed. We are at a tipping point in the relationship violence movement because people are speaking out, male and female. I think we are very much at a tipping point in the relationship violence movement because people are really speaking out, male and female. It’s so important to just to break the silence. Because you actually have no idea who you’re helping when you talk about it, and signal to others that it’s an open subject for you. At some point, you might be a lifeline to someone. It’s funny to work in this field. You’re on a plane, or you’re at a party and you say what you do. And the conversation comes to a full and screeching halt. But then it continues with a wonderful kind of candor and gravitas. If you are able to signal that you’re willing to talk about it, people are really curious. The only way we can get past the ignorance is to talk openly about it. The only way we can get past the ignorance is to talk openly about it. Esta Soler: The plane is really where it happens all the time. Early on, when we did our first public campaign with the Ad Council, one of the elements was putting bumper stickers on cars. It was just amazing how many people would approach people who had the bumper sticker on their car and ask them for help. This is an issue that really benefits from public discussion and visibility. Don’t call this a “women’s issue.” 85% of victims are women, but the vast majority of perpetrators are men. Domestic violence in the United States is down 64% since VAWA. What tools and tactics can we use to address the other 40%? Esta Soler: Engaging men as spokespeople in this issue is something that I am totally committed to. Coaching boys into men is critical, and it’s critical that men are our partners in this. Engage men as spokespeople, too. Leslie Morgan Steiner: Yes. Victims are the people who need the most help, but in order to really solve this, we have to shine a very bright spotlight on the perpetrators — and on why men feel that it is somehow acceptable to beat the people who love them the most. It’s amazing to me how this issue has been unsuccessfully marginalized as a “women’s issue.” When I do speaking engagements, sometimes men will say, “I didn’t think I belonged here, because it’s a woman’s issue.” It just makes me laugh, because 85% of the victims are women, but the vast majority of the perpetrators are men. There’s no way we can solve this if we focus just on the victims. Find ways to intervene and get batterers the help they need — so that they don’t continue to do this. We have to shine a big enough spotlight so that we understand why children who are abused grow up to be abusers themselves. My ex-husband was a textbook case. Everything he did was very predictable and typical. I feel like if it’s that predictable, there should be somebody who can analyze it and figure out ways to intervene and get batterers the help that they need so that they don’t continue to do this. Use danger assessment tools as awareness and as law-enforcement tools. Tools like Jackie Campbell’s [danger assessment] are really important to use, because they look for the biggest warning signs in terms of lethality. We wouldn’t have that kind of tool, and it wouldn’t be so widespread around the country, if we didn’t have VAWA funding. The next stage is to use those tools as awareness and as law-enforcement tools. For example, after there’s been an incident, police can go and interview the victim and give her a score on the lethality index. And there’s been some beta testing of the lethality index among local police forces. If she’s above a certain level, they step up their follow-up. It’s really effective. Instead of not visiting her again at all, maybe they come once a week — it depends on the particular protocol. Start having conversations about domestic violence when kids are just starting to date. Esta Soler: Research is also telling us that the transition from elementary to middle school may be one of the best places for us to start having conversations [about domestic violence]—when kids are just starting to date. We just finished a major project with the Robert Wood Johnson Foundation, working with middle schools in 11 different communities. One of the things we found was that kids who came from homes where there’s a high level of violence actually used the program even more successfully than kids in general. Leslie Morgan Steiner: It’s a distasteful thing to think about talking to a little kid about the fact that violence occurs in families, but it’s just a reality. I spoke to my children about the fact that I had been an abuse victim before they were each 5 years old. It’s a very simple conversation, if you’re willing to have it. The way that it went with me is when they came home and told me that somebody they knew was divorced, I used that as an excuse to say: “Mommy was married and divorced before too. I loved somebody very much, but he used to hit me, and you can’t stay with somebody who hits you, so I had to leave him.” My kids completely understood it. If you’re a doctor or nurse, screen for violence exposure. Esta Soler: Two more things I want to mention. One: It’s in the preventative section of the Affordable Care Act that doctors and nurses can now get reimbursed if they screen for violence exposure. That’s huge, because most people will turn to their doctor or healthcare provider way earlier than they’ll call the police. And two: the workplace is a really important place to put in place policies and programs. Leslie Morgan Steiner: The reason the workplace is so important is that when you’re working with somebody day in, day out, you often are one of the first people — even before their own family — who is able to recognize that a victim is being abused. Abusers are really good at isolating the victim from family and friends, but they don’t want to isolate them from the workplace. People will often confide in their co-workers, or their co-workers will start to suspect what’s going on. Where do you think we are as a culture on the journey to end domestic violence? Esta Soler: We still have a mountain to climb, but we really have made huge changes on the social norm and the acceptability of violence against women. Leslie Morgan Steiner: That’s just right. We have come a long way, thank god, and we have a long way to go. If you or someone you know may need help, please call one of the numbers listed below. Violence-prevention educator Jackson Katz’s resource list.